Portsmouth Football Club (often known as Pompey FC) was founded on 5th April 1898 by John Brickwood who was a local brewery owner. The club joined the Southern League in 1899 and played their first league match at Chatham Town on 2nd September 1899. From the early beginnings of the Football Club it has gone from strength to strength. The club established themselves and in the 1938-1939 season Portsmouth reached their third FA Cup Final and completed their famous victory. League Football was suspended during World War Two which meant Portsmouth held the FA Cup for the longest uninterrupted period, until the 1945-1946 season. Portsmouth was promoted to the First Division in 1986-1987 and in 2002 Harry Redknapp took over as Manager and just over a year later the club was promoted to the Premier League. In 2008 Portsmouth won the FA Cup again. After returning to Portsmouth the players and Manger (Harry Redknapp) boarded an open top bus for a parade through the City which was lined by tens of thousands of people before arriving at Southsea Common where hundreds of thousands of people waited to greet the team. 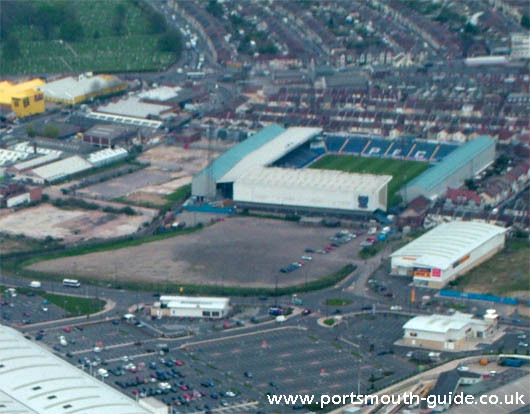 The football club’s home is currently at Fratton Park within the City Of Portsmouth but plans are underway to create a brand new station for the club.